And a few stray thoughts for yet another Saturday. For a Saturday following the week when Congress President Rahul Gandhi made a courtesy call on Chief Minister Manohar Parrikar in the Assembly complex. 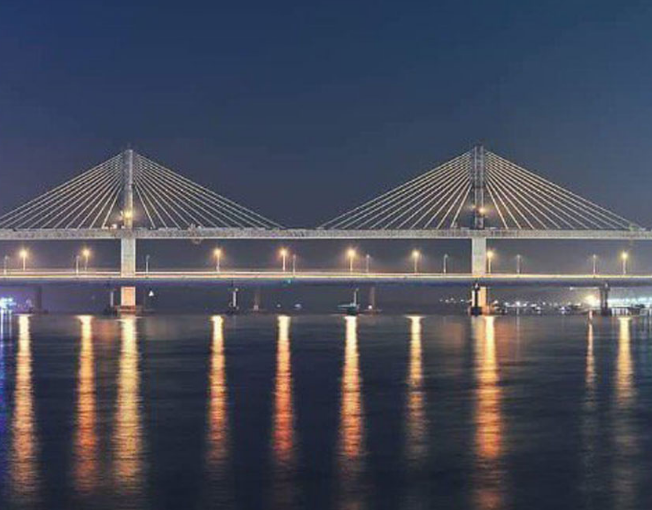 For a Saturday following the week when the new Mandovi bridge was inaugurated on Sunday at 7:30 pm by Chief Minister Manohar Parrikar along with Union Transport Minister Nitin Gadkari. For a Saturday following the week when on a visit to Mumbai I discovered the extent to which locals and tourists were been looted by the taxi mafia. For a Saturday following the week when the DD Kosambi festival, which used to be the height of the intellectual winter season, has been reduced to a token saffronised gesture. And a few stray thoughts on when Manohar Parrikar, the finance minister, presented a paperless digital budget to the surprise and agitation of most of the senior MLAs and journalists who are IT illiterate. My first reaction when I got the so called digital budget documents was one of confusion, as I did not know how I would access the budget from the tablet which was given instead of the usual briefcase full of budget papers. Manohar Parrikar clearly has his entire hosh back. Parrikar who presented the budget on Wednesday, January 30, just read a few lines and did not present the full budget. There are many interpretations of hosh but in the case of Manohar Parrikar it means he is now fully conscious of how to fool all the people of Goa all the time. Incredibly, Finance Minister Parrikar presented an 455 crore surplus budget, even while acknowledging that the tax deficit was1,418 crore. The total expenditure which includes revenue expenditure and capital expenditure amounts to roughly `18,000 crore. Manohar Parrikar offered the aam aadmi of Goa a lot of josh but unfortunately any citizen of Goa who has as much hosh as Manohar Parrikar will wonder where the money is going to come from. Mining has been suspended. Tourism is in reverse gear. The production of popular varieties of fish like sardines and pomfrets dropped by 89,000 tonnes. And yet Parrikar has the josh to make fools of people of Goa. Yes the budget is full of josh, Manohar Parrikar is in full hosh but unfortunately there is no money in the kitty. Which is why no schemes were announced contrary to my expectation that there will be a ‘Ladla Laxman’ for the boys like the ‘Ladli Laxmi’ for the girls. Mercifully there are no new taxes either. It is not even a budget, it is a vote of account for the expenditure for the next five months out of which we hope hundreds of crores of pending payments, including those of the Goan Observer, will finally be released. And a few stray thoughts on Congress President Rahul Gandhi paying a courtesy visit on Chief Minister Manohar Parrikar at the Assembly session on Wednesday. Rahul, who arrived in his traditional white kurta pajama at the Assembly complex was met by the deputy speaker who escorted him straight to the chief minister’s chamber. Significantly, Speaker of the Assembly Promod Sawant who should have done the honour for the leader of the second largest party in the country, was not present. Rahul Gandhi who spent just three minutes with Manohar Parrikar made it very clear that there was nothing political about it and it was purely a visit to enquire about the health of the chief minister. Rahul Gandhi reportedly asked Parrikar how he managed despite the critical illness that he was suffering from. Parrikar is reported to have replied that “it is in my nature and once I decide to do it”. Rahul also told Parrikar that his mother Sonia was a frequent visitor to Goa and spent Christmas and New Year every year at the Leela resort. The fact that Rahul Gandhi took time out from his holiday to pay a goodwill visit to Parrikar shows the difference between the sophisticated cultured Rahul and the uncultured BJP leaders. It is unlikely that in similar circumstances Narendra Modi or Amit Shah, who is supposed to be Goa for a wedding, would have called on a member of the Gandhi family if they had been ill. As far as I recall no member of the BJP called upon Sonia Gandhi who has been suffering from a serious illness for several years. The BJP whether in Goa or in Delhi seems to be cursed by the gods with a number of its top leaders falling sick. For the second time Union Finance Minister Arun Jaitley will not be presenting the Union budget on February 1, 2019, as he is in New York for treatment for complications relating to his kidney transplant. The Union budget or the vote of account is likely to be presented by Piyush Goel who has been designated Finance Minister while Jaitley now is minister without a portfolio. Come to think of it, since Parrikar has been ill for over a year, the BJP high command could have appointed someone else as the chief minister and given the title of minister without portfolio to Parrikar so that he could continue to enjoy the medical benefits that all Cabinet ministers are entitled to. Both Deputy Speaker Michael Lobo and Goa Forward chief Vijai Sardesai seem to be very happy with Rahul Gandhi for making the effort to visit Manohar Parrikar. Michael Lobo is reported to have said, “Rahul Gandhi is one of the leaders of the world, he is a very simple and very humble person who came on a private visit to Goa, but made it a point to visit ailing Chief Minister Manohar Parrikar”. We wonder whether this is the signal that Michael Lobo might decide to join the Congress. The Town and Country Planning Minister Vijai Sardesai also initially commented that Gandhi visiting Goa Legislative Assembly and enquiring about Parrikar is the positive development in politics, “the political leadership of the country is concerned about the health and well-being of even his opponent is something which has to be applauded. Even if your ideology is different, the health and wellbeing of the opposition leader is important”. It is learnt that though Rahul Gandhi along with Priyanka and Sonia are in Goa on a private visit, Rahul is likely to meet Congress President Girish Chodankar who was closely associated with him when he was secretary of the AICC. The fact that Digambar has also been summoned might suggest that the Congress may be considering toppling the BJP government with the help of Goa Forward and Independents. Among other Central BJP leaders who are keeping poor health is Foreign Minister Sushma Swaraj who had a kidney transplant, and has decided not to contest or campaign in Parliamentary elections. Appropriately Amit Shah developed swine flu and was admitted in the All India Institute of Medical Science (AIIMS) along with Communication Minister Prasad. In Goa, Francis D’Souza, former deputy CM, is yet to recover completely from his kidney transplant. Former Power Minister Pandurang Madkaikar, who had a stroke allegedly after consuming viagra, is still to fully recover from his misadventure and is in the same condition as former MLA Vishnu Wagh. The BJP’s MLA from Vasco, Carlos Almeida, is also reported to be unwell. The Legislative Assembly looks like the disability ward of the GMC rather than a meeting place for MLAs. And a few stray thoughts on the inauguration of the new Mandovi Bridge. Originally word went around that the third Mandovi bridge would be inaugurated on Republic Day by Prime Minister Narendra Modi who had laid the foundation stone. The story was that Modi would travel to Goa to meet his friend and mentor Manohar Parrikar and inaugurate Parrikar’s dream project. It was also alleged that Modi was keen on meeting Parrikar personally to tell him to keep his mouth shut over the controversial Rafale deal. Indeed during his visit to Goa Rahul tweeted that since no enquiry or FIR has been filed against anybody over the audio leak showing Ajay Thakur discussing the Rafale deal with Vishwajit Rane even 30 days since the Goa audio tapes were released, tweeting “it’s obvious that the tapes are authentic & that Goa CM, Parrikar, is in possession of explosive RAFALE secrets, that give him power over the PM”. So far nobody in the Centre, including Defence Minister Nirmala Sitharaman, has commented on the controversial audio tape. We must congratulate Manohar Parrikar for the real josh he displayed while inaugurating the Mandovi bridge, although he was in his sweater and a woollen cap to cope with the cold on top of the bridge. He not only inaugurated the bridge, but even gave a speech referring to the new josh he has acquired after watching the film ‘Uri’ on the surgical strike carried out when he was defence minister as retaliation for Pakistan’s attack on Indian soldiers and civilians. Parrikar lamented that Goans were negative over everything and he was gifting them his josh so that they would become positive. Though the bridge has been inaugurated it has still not been thrown open to traffic. The bridge which was to be thrown open to traffic by Tuesday is now going to be made operational only on February 4. Parrikar may as well have waited till Valentine’s Day to allow couples to take a romantic stroll on the bridge. Apparently the bridge is conceived not just as a connecting link between north and south Goa but also a tourist attraction. Despite warnings that pedestrians will not be permitted to use the bridge along with two and three wheelers, thousands attended the inauguration. As if it is the latest tourist attraction, the aam aadmi has been allowed to walk across the bridge for the next few days till the vehicular traffic starts. Manohar Parrikar has had the satisfaction of seeing the bridge almost completed and has inaugurated it despite suffering from pancreatic cancer for a year. We consider this a greater achievement than the surgical strike in many ways. And a few stray thoughts on why Goa does not need any more bridges or highways but should have mass transport as in Bombay or in Bangalore. On a recent medical visit to Mumbai I was very pleasantly surprised by how efficient and convenient the new metro was. Besides the metro, Ola and Uber and even the blacktop cabs in Mumbai are strictly regulated. It cost me only 200 plus to travel from Chembur to Juhu — a distance equivalent to the distance between Panjim and Margao. The telephone in the Ola cab was connected to the GPS system. The GPS system constantly advised the driver the least congested route to take. From specific points the Ola GPS system informed the passenger and the driver how long it would take to reach the destination through various routes. There was no argument about the fare which was decided at the time you call for the Ola car. At the end of the journey you paid the agreed amount and even got a receipt. Contrast this with what happens in Goa. The Goan taxi mafia has refused to allow Ola and other agencies, including Indian agencies, to enter Goa. Even Goa Miles, started by the Tourism Department, is virtually dead. Unlike the cabs in Mumbai, Goan cabs will not permit GPS systems to be installed so that they can take you for a ride. If a tourist wants to travel from Panjim to Colva they can take him via Morjim as the tourist will be none the wiser. The Goa taxi mafia has also turned down the proposal to install speed governors which would greatly reduce accidents that take place every day. Despite the boasts of DG Mukhtesh Chandra, taxi drivers continue to ignore seat belts and constantly refuse to install even meters. You have no choice but to pay them what they demand and a few weeks ago I remember having to pay3,000 (including waiting charges) to travel from Panjim to Margao to attend a felicitation of a dear friend. The bottom line is that it is not the owners who drive the cabs but migrant employees who can be hired cheap. There are literally thousands if not lakhs who made money in the Gulf and get SUVs and taxi permits to ply in Goa. These taxi owners form a huge vote bank in the coastal areas. Even if your taxi driver wants to charge less than the extortionate rate asked by his friends, he dare not do so, as he will be beaten up. So much so the taxi would rather sacrifice a fare then reduce the price. You can drop a guest or a passenger from the airport and a railway station to his hotel. But you cannot pick up a passenger, even your own brother or wife or girlfriend from a hotel, even in your private car. Every hotel has taxis attached and you have to hire the taxis registered with them. Those who do not agree to pay kickbacks are boycotted as in the case of the Manipal Hospital where you cannot get either taxis or rickshaws to go home after discharge. Unless you have a car or a driver you cannot afford to get yourself admitted to the Manipal Hospital. I only hope that the tourism minister and the chief minister, who now seems to have recovered, will focus on a metro or an extension of the Kokan railway to the main cities and the beach belt, instead of katrufying the tourist and the locals. Even Nitin Gadkari’s ‘Sagar Mala’ which envisages transport by water or through rivers will be cheaper than catching taxis. And a last stray thought on the DD Kosambi memorial lecture series — among the most prestigious events in Goa. Held every February, it attracts the top most intellectuals in the country and the world. In the past, under Prasad Loliekar, the then Director of Culture, we had the honour of listening to some of the most distinguished people of the country ranging from Abdul Kalam, the former president of India, to Nandan Nilekani, who is known as the architect of Aadhaar, to Sudha Murthi, the wife of the founder of Infosys who heads the biggest charity organisations. The government was liberal and called experts in education like Dr Vivek Monteiro, who was a senior leader of the Centre of Indian Trade Unions, Maharashtra State. For those who might not know, DD Kosambi was a world famous mathematician who also wrote some of the best history books in the country. He was also a great admirer of Konkani and among the greatest intellectuals that Goa has produced. The lectures, which last a week, were a fitting tribute to DD Kosambi. Ever since the BJP came to power in 2017 the lectures have been devalued and saffronised. We have nothing against young people, but the first speaker this time was a 20-year-old photographer for National Geographic, Malaika Vaz, who spoke about climate change and who is the daughter of the owner of Big Boss feni. The second lecture was by Dr Mickey Mehta who spoke about holistic healing although he was from Harvard University. The last lecture was by a saffron swami. The DD Kosambi lecture series has become an insult to the great scholar.